575mm high, requires 2 x doors 570mm high and includes 1 x adjustable shelf. 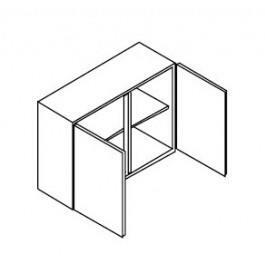 720mm high requires 2 x doors 715mm high and includes 2 x adjustable shelves. 900mm high requires 2 x doors 895mm high and includes 2 x adjustable shelves they all include BLUM Clip on Hinges and fully adjustable concealed hanging brackets and wall mounting plates.